This is a summary of a little talk I have given a few times here and there, most often to high-school students in preparation for the Protocol event at Logos School, or to college students at New St. Andrews College where the students are frequent guests in the homes of their instructors or families in the church community. What is a guest? Simply put, it is someone who is on the receiving end of hospitality. Everyone wants to be a guest; we want to be included, not left out. The Puritan preacher Matthew Henry said, “Man was intended to be a sociable creature, and a Christian, much more so.” God created us to live in community, so we will have many opportunities to be guests as well as hosts. Each role has its duties and responsibilities, but right now we’re going to discuss the duties of the guest. We might not realize how often we really are guests. We are a guest (in a sense) when we are in any place where someone else has prepared for us. We are a guest in a museum, a hotel, a restaurant, a store, in the classroom, at church, and even when we are riding in someone’s car. In all these settings we should have a common demeanor of humility and appreciation, making our hosts’ jobs more pleasant. All these duties have one thing in common: the guest is being considerate of the host. It’s a way of loving our neighbor. For example, in a store we don’t leave a mess behind. If we knock a sweater off the rack, we pick it up. We don’t leave our empty Starbucks cup on the shelf next to the canned beans. At school we give the instructor our full attention, and we don’t leave trash under our desk for someone else to deal with. At a hospital, we keep our visit short (unless it is a relative we are visiting), and we speak quietly. We don’t ask personal questions or tell gruesome stories. But these are not the primary settings I want us to consider today, but rather how we are to be guests at other people’s homes, whether at parties, potlucks, dinners, receptions, or even weddings. So here’s a list of common do’s and don’t’s. 1. RSVP as soon as you can. Don’t leave the host wondering. And always save the invitation in a safe place. I don’t think the refrigerator door is a safe place! I actually have a file where I keep wedding invitations….so I have no excuse if I can’t remember what time the wedding is or where it is or whose name is on the invitation. 2. If you didn’t RSVP, you just can’t show up anyway. If you did RSVP, but you forgot you were going to be out of town that day, of course contact the hostess and let her know you must send regrets. Never bring uninvited guests along and never ask if you can bring uninvited guests along. 3. Arrive on time. For a wedding, that means 15-20 minutes before the event is scheduled to begin. For dinner, five minutes before or after the scheduled time is acceptable. If you are suddenly taken sick or otherwise held up (hopefully not at gunpoint), contact the hostess. 4. Dress appropriately! Better a little over dressed than to be too casual. When in doubt, ask the hostess in advance. 5. Greet the host and hostess! Don’t just head for the refreshments. Wait to be invited to fill your plate at the buffet table. 6. Don’t show up starving. It’s better to take the edge off by having a small snack beforehand. And don’t load up your plate so it looks like Mt. Vesuvius ready to erupt. For appetizers, take 3 or 4. 7. At a buffet, don’t stall out the line by chatting with your neighbor. Remember that the good stuff is usually at the end of the line, so go easy on the bread and salad or you’ll have no room for the main dish. And of course, don’t eat as you go through the line. 8. Watch where you set your glass….don’t leave a glass in a weird place for your hostess to find a week later. If you set it down, use the napkin or coaster provided. Remember where you leave it, so you don’t have to keep getting a fresh glass. 9. If you need to do a quick wash-up before dinner, never, I repeat, never go into the kitchen and wash your hands in the kitchen sink. Find a washroom. 10. If you spill something, let the hostess know. 11. Take an appropriate seat. Don’t sprawl. Ladies, keep your feet on the floor, not tucked up under you. Men, don’t tip in your chairs. Men, stand and help seat the ladies. 12. Leave the gum at home. After having guests, I’ve found chewed gum in my kitchen sink, on my front sidewalk, and stuck on the back of a leather couch. 13. Be chatty. Be a participant, not a spectator. Don’t be a dud. Ask questions and be a contributor. That’s much more fun for everyone. 14. Don’t wander around the house looking at stuff, opening cupboards, or going into rooms you were not specifically invited into. 15. If your hosts have little kids, be friendly but don’t overdo it by instigating hide-and-seek unless you have checked with your hosts. 16. Please don’t blow your nose on your napkin or lick your knife. 17. If you’re seated around a table, just ask and the dish can be passed. Don’t reach across someone to get more potatoes, even if that’s okay at home. 18. Avoid staring, scratching, burping, picking, cracking your knuckles, or bouncing. And try to keep your hair out of your plate. Don’t tell unappetizing stories. 19. If you are tired, go home. Don’t fall asleep in the recliner. 20. Don’t over stay! My dad always said, “It’s better to leave while you’re still having fun.” I would add, “While your hosts are still having fun.” Don’t make them ask you to go. College students will stay until the wee hours if you let them, so make sure they know in advance when the party’s over. 21. Thank your host and gather up all your stuff. 22. Write a thank-you email or a real note on real paper. Keep it simple. This is a great post, so practical and sensible. It will be one I refer to often as the kids grown up – a great little check list! Wow, I am embarrassed to admit that I learned quite a bit by reading this. I didn’t know that it’s not okay to wash hands at the kitchen sink. Is it okay for myself as the hostess to wash my hands at the kitchen sink while getting the food ready? Oh, Amy, I mean it’s not so helpful for a guest to go wash up in the kitchen while the hostess is getting dinner ready. Of course the hostess has her hands in the sink quite a bit! For those who have been or might someday be guests at my house, you may ignore numbers 19 and 20. I always feel sad when everybody leaves what seems like too early! Yes to not bringing uninvited guests! There was a reason I only invited who I invited to my wedding! Great reminders! Evite should pay you so for this handy list, and include it! This is a very practical post that I will be reading at the table tonight. Although we teach our children table manners, there are quite a few points made that could easily be overlooked in training our children to be kind guests. I do believe that if you require these within the home that they are much easily remembered when out. Thanks, Nancy! I thought I heard one time that it was not proper to wash your hands (ever) at the kitchen sink, so I thought I’d better ask to make sure I wasn’t doing something inappropriate. It’s so great to hear this all over again in one place. I’m trying to teach my boys to be polite at gatherings but this is so succinct! I will read it to them and we will start practicing! I’ve also found candy and gum in my carpets. 13. Don’t be too chatty. Meaning, don’t overpower and control the conversations. > Pay attention and care for your children as guests. Don’t just let them run around and be forgotten. Check on them periodically if they are elsewhere in the house or event. Have your children help clean up anything they contributed to playing with before you leave AND check to make sure they actually did. > Help your children serve their food. Portions and proper handling is polite. > Bring a “host gift” if visiting their home. It’s a nice gesture of thanks. At least the very first invite. Even if it’s a small thing, like chocolate, or coffee. Although, for some, those are essentials! I also think once you become closely acquainted enough with friends, you will learn what goes or doesn’t. But in any case, if you aren’t sure, it’s always safe to ask, or just refrain. Rules of hospitality can be helpful, but culture, customs and traditions can cause these to vary greatly! We now live in Tanzania, and the “rules” are very different. But what stays the same is the heart of hospitality – both in the giving and receiving. We (including our two young daughters) have learned so much about the true heart of hospitality (outwardly sharing God’s generous and humble love for people) living here, which I hope will help us wherever we go, whatever the customary rules are! 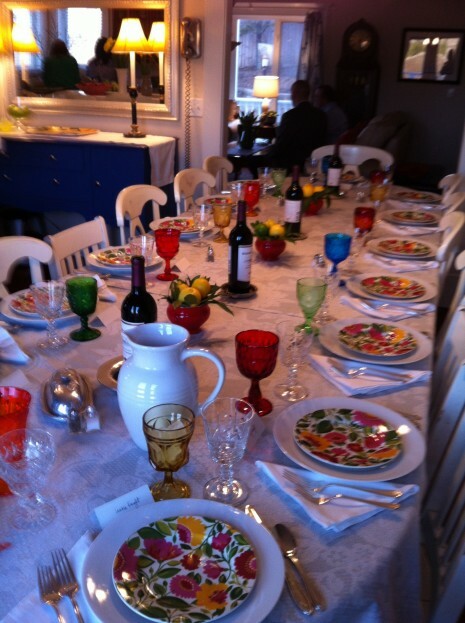 …love seeing your goblet collection in ‘action’…very pretty! As a college student just beginning to move into the hostessing stage, I’d love to hear some of your tips for the other side–the hostess’ side–as well! Oh Nancy I love your list! Our home has been the center of hospitality for years and it is our delight to provide a meal and a bed for wearied souls. I must add to your list…don’t bring your dog or cat to the home you are visiting! You just may find that you wear out your welcome quickly. Thank you for posting these wonderful tips to teach our own chikdren. I love the table setting! How beautiful.